President Hugo Chavez is receiving chemotherapy in a Caracas hospital after cancer surgery in Cuba, Venezuela’s Vice-President Nicolas Maduro has revealed. Nicolas Maduro was speaking after a Mass at a military hospital in honor of Hugo Chavez. On Thursday, he went on TV to say Hugo Chavez was battling for his life. President Hugo Chavez, 58, re-elected in October last year, returned to Caracas last month, but little has been heard about his condition until now. Photos of him in smiling in bed, with his daughters beside him, were released shortly before he was flown home. Late on Friday, a Mass was held at a new chapel at the Caracas Military Hospital, where the authorities say he was taken for treatment last week. One of Hugo Chavez’s daughters, Maria Gabriela, and senior officials attended the Mass. “The treatments Commander Chavez is receiving are tough, but he is stronger than them,” VP Nicolas Maduro told reporters as he left the chapel. Nicolas Maduro was speaking after opposition leader Henrique Capriles accused him of lying repeatedly about the president’s “real situation”. As speculation mounts about the president’s future, a number of students have chained themselves together in a street in the capital, insisting the government “tells the truth”. 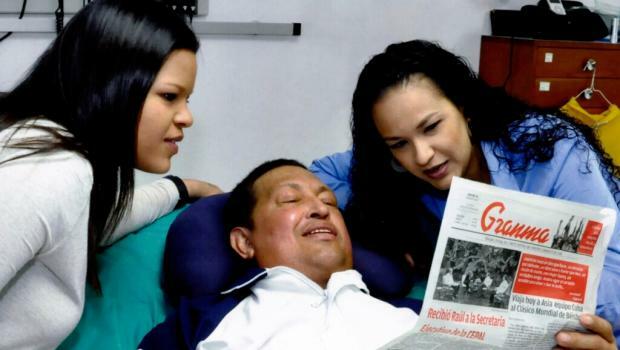 The government says Hugo Chavez is breathing with the help of a tracheal tube and meeting senior ministers from his sickbed at the military hospital. Nicolas Maduro told reporters that after a “general improvement” in his condition, the doctors had decided to start “complementary treatments”. The vice-president added that Hugo Chavez was communicating with his aides “in writing and other ways he has come up with”. Hugo Chavez, who has been in office for 14 years, revealed he had cancer in June 2011 and has already had four operations, as well as chemotherapy and radiation therapy. It is believed he has cancer in his pelvic area but his exact illness has never been disclosed. Last seen in public late last year, Hugo Chavez was reported to have suffered a severe respiratory infection after treatment in Havana. Hugo Chavez was re-elected for another six-year term in October 2012, but the Supreme Court ruled that his swearing-in could be delayed because of his illness. It was reported that more than half of Venezuelans believe Hugo Chavez will recover from his illness, although almost a third do not believe he will return to power. VP Nicolas Maduro has been named by Hugo Chavez as his successor. If Hugo Chavez is unable to return to office, an election must be held within 30 days under the constitution.